This is a family recipe, no denying it. It was my Aunt Martha’s creation, but quickly became a holiday staple in my house as well. I distinctly remember eating this cake as part of our Thanksgiving or Christmas dinner, and then again the next morning for breakfast; a huge treat for my sisters and I. Now I make it too (although the pears are a recent addition), because it is mixed and in the oven in under fifteen minutes, and because it makes my kitchen smell divine. The flecks of mild, sweet pear and bites of sour cranberry are little gems, lending this moist, citrus-spiked cake a distinctive holiday look and taste. In a large bowl, whisk together sugar, zest and eggs. Mix in orange juice. Pour in melted butter, while whisking vigorously, so the butter does not coagulate. Stir in flour, one cup at a time. Add wheat germ and baking soda, and incorporate. When the batter is mixed smoothly, add (slightly mashed) pears and cranberries, and integrate. 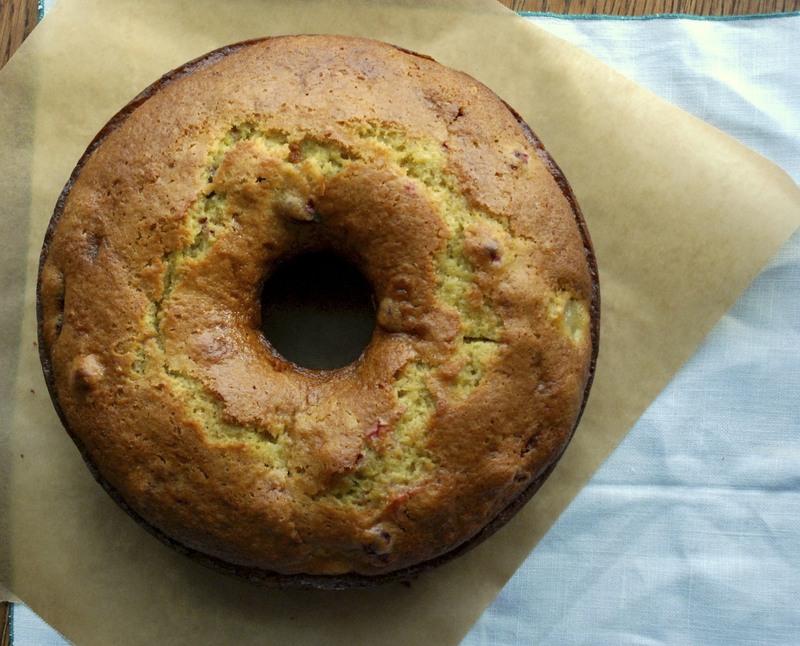 Pour batter into a well-buttered bundt pan. Looks great, love your site. You can also use pineapple juice instead of orange juice and chopped pineapples (use the pineapple chunks and cut them down) instead. Cut up macadamia nuts mix with sugar and sprinkle on top. All other ingredients are the same and you prepare the same way.